New for March 2008! We're finally getting around to splitting up our college page, it's way to big already and it barely scratches the surface of the programs that are out there. Contact us if you want your college to get its own page! So, why would you want to go to Georgia Tech, beside the fact that Atlanta has nice weather? Sure, Georgia Tech provides a nice campus, but there's so much more. 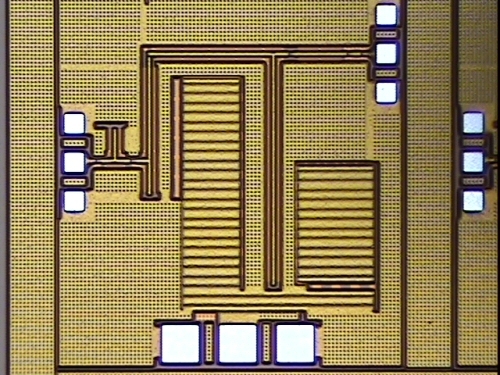 The microwave group has focused on the possibilities of millimeterwave circuits using production processes at IBM's SiGe foundry in Vermont. Using plain "old" 8HP, they've managed to stake out a ton of figure-of-merit records for gain, power consumption, noise figure at frequencies that include Q band and W-band. Just a few years ago, no one would have thought it to be possible to achieve 12.5 dB per stage at greater than 90 GHz. Thanks to the Georgia Tech team, it's now routine. 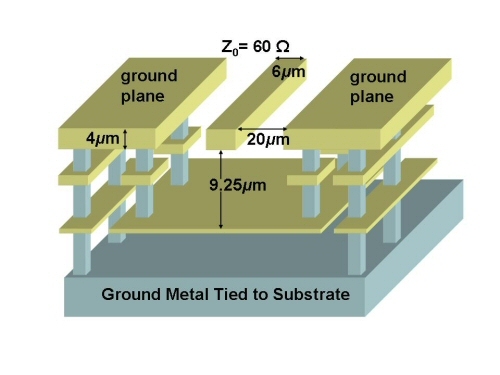 Achievements like this go way beyond being in the right place at the right time to leverage the latest device technology, a new low-loss transmission line had to be developed that takes advantage three-dimensional possibilities of IBM's metal stack above the lossy silicon substrate (think CPW combined with microstrip). 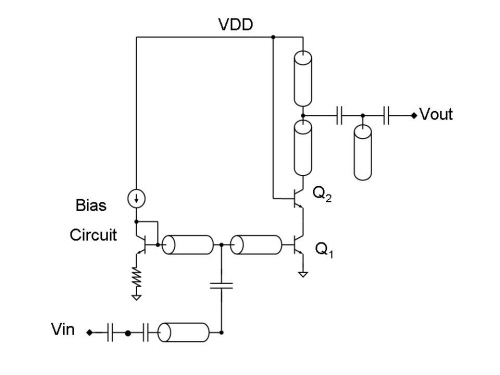 Nothing is wasted on these circuits, the blank area is consumed using a high-density capacitor technique for bias bypass circuits. This is a whole new ballgame compared to the 2D life most MMIC designers are used to. Below are some images of millimeterwave SiGe circuits developed by GT. Here's the low-loss transmission line they use, it works so well IBM added it to their design kit! For the following explanation of how Georgia Tech's microwave/RF capabilities are organized, we offer most of the credit to Drew. Thanks! - Paul Steffes: Right now, he is working on a project called Juno, which is a NASA mission to Jupiter. His specific role is developing the hardware and techniques for remote sensing of the water and ammonia content of Jupiter's atmosphere. Those compounds give off radiation at microwave frequencies that is attenuated in certain ways based on a number of different factors. In short, he is the person to talk to for microwave remote sensing at Georgia Tech. - John Papapolymerou: He is actually dual-hatted within Emag and EDA, and is probably an excellent guy to talk to for RF hardware at microwave. His research group is called the Microwave Circuit Technology Group. Among other things he's working on Cognitive Radio (see http://en.wikipedia.org/wiki/Cognitive_radio for more information). - Manos Tentzeris: He's involved in the field of antennas, but his group does some work with RFID (including RFID at microwave). - John Cressler: He's involved in the Electronic Design and Applications TIG. He previously worked at IBM and one of his major interests is silicon germanium. Georgia Tech Research Institute (GTRI) does a lot of government and defense work (and therefore they do not have much contact with GT students). GTRI partners with many well-known U.S. defense contractors for bleeding edge research. For applied microwave research, check out Georgia Tech's sensors and electromagnetic applications laboratory (SEAL).